En el encuentro de Jesucristo con el leproso samaritano se nota que los dos se sorprenden no sólo por la curación milagrosa de un extranjero, sino también en el dar gracias de un “enemigo” de los judios. What is very striking in St. Luke’s account of the encounter between the Samaritan leper and Jesus is that a perceived enemy of the Jewish people is shocked to be healed by a Jew and that Jesus is profoundly moved that it is a Samaritan who alone returns to give thanks and praise for his cure. Es en aquel encuentro tan signifcante que las barreras del racismo y del prejuicio se destruyen. 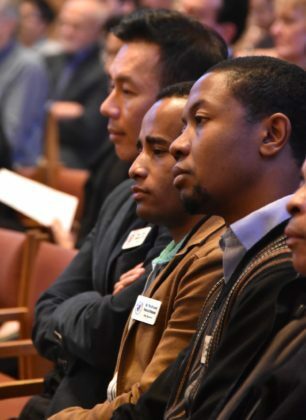 What makes this event even more significant is that it moves beyond ethnic generalization and identifies two individuals whose encounter breaks down the barriers of stranger and exclusion. ¿Cómo comienzo a enfrentar la oscuridad en mi propia alma que no me permite mirar el rostro de Dios en el forastero? How do I begin to face that darkness within me that refuses to see the face of God in the stranger? Here at SHSST we are blessed with a rich diversity of cultures from around the world. Aquí estamos bedecidos con una diversidad cultural muy rica que nos rodea cada día. Pero, ¿cómo apreciamos y aceptamos a nuestros hermanos internacionales en el comedor, en la aula, en la capilla, o en el corredor? We celebrate that diversity in liturgy but how well do we know those who live among us, share meals with us, pass us in hallways, and pray by our sides? I learned an important lesson seven years ago when I began encouraging native Spanish speakers and native English speakers to pair together as partners to practice speaking their target languages. Year after year, I discovered that the partners had developed lasting friendships and learned far more than the target languages. Their appreciation for one another as individuals with unique stories and common interests and fascinating differences helped form them into true partners and companions. Me di cuenta que es solamente cuando miro al otro con mi corazón abierto y dispuesto a escuchar su historia y compartir con él la mia que comienzo a convertirme de mis prejucios y con sinceridad ofrecerle la bienvenida. I realized that when we see the face of the stranger in another individual and open our hearts to his/her story and share our own, we begin to move beyond our own prejudices and truly “welcome” the one whom we did not know. Hoy quisiera desafiar a todos nosotros a arriesgar cruzar las barreras culturales, por aprender el nombre, por escuchar la historia, por descubrir las tradiciones de una persona a quien todavía no conocemos. Se nos agrandecerá el mundo hará más compasivos el corazón, y profundizará en nosotros el mistero de la santa Eucaristía que celebramos diariamente. I’d like to challenge each of us today to reach out beyond our personal boundaries and take the risk of meeting someone in the community whom we do not know, whose name we have not learned, whose story we have not heard, whose life, traditions and culture still remain a mystery to us. Our world will become wider, our hearts more compassionate and the mystery we celebrate at every Eucharist more profound.